You can't have Thanksgiving without a turkey. Well…I suppose you can. Last year we had salmon and acorn squash, but that's beside the point. This Lemon-Garlic Turkey Breast with White Wine Gravy recipe got rave reviews from Eating Well Magazine. Without sacrificing taste for calories, this recipe substitutes butter, salt and gravy with the bold flavours of lemon, garlic and white wine. Find the full recipe here. Stuffing is potentially one of the leeeeast healthy dishes on your Thanksgiving table, BUT, it doesn't' have to be. I realise that asking you to go without this carbohydrate classic is unlikely, so instead I'm recommending this delicious Pear, Prosciutto and Hazelnut Stuffing. Swapping white bread for a multi-grain loaf - adding fiber, nuts, fruits and vegetables is a great way to turn this dish into a healthy side. Find the full Eating Well recipe here. Now, before you get all worked up, give this a chance. 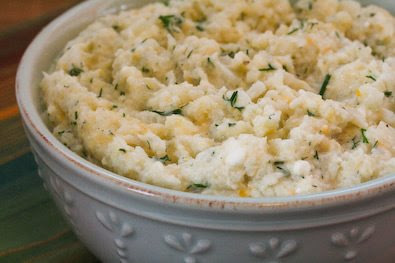 In lieu of mashed potatoes, try this Mashed Cauliflower Recipe - a favorite healthy substitute in our household. While the texture is slightly different, the taste is strangely similar to those delicious buttery mashed potatoes we all know and love. Follow step-by-step instructions (video included) at Inspired Taste. You can't have thanksgiving without some sort of casserole, right!? So how about making this lighter Sweet Potato Casserole from the Food Network. With only a bit of brown sugar and honey, this recipe has all the spice and none of the waist-line enhancing extras. If you're channeling your inner Jillian Michaels this year, serve baked sweet potatoes topped with cinnamon and nutmeg instead. Healthier or healthiest…how much is it worth to you? Green bean casseroles are so out! Why on earth would you take something super healthy and make it ridiculously unhealthy? Especially when it's everybody's least favorite dish anyway? I mean, really. Instead, serve this simple Blue Cheese-Walnut Green Bean side from Eating Well. Save yourself the excess fat and sugar and go right for the greens! If blue cheese isn't your thing you can substitute it for feta and drizzle a little balsamic vinegar on top too!! I am obsessed. I mean, really, truly obsessed with brussel sprouts. My only issue with them is that when I eat too many I feel like one of the Thanksgiving Day Parade floats. I realise that not everyone shares my taste for these little green cruciferous veggies but I'm asking you to give them another chance. The secret is to ROAST them. Nobody likes boiled little balls of cabbage. gross! You can roast them on a baking sheet until golden brown, or sautee them like this recipe calls for - Sauteed Brussel Sprouts with Bacon and Onion…let's face it, bacon makes everything better. This recipe looks de-lic-ious! The HealthyFoodie gives us easy-to-follow instructions on how to replicate her beautiful Crazy Good and Unbelievably Healthy Pumpkin Pie. Think of this as the perfect guilt-free ending to your special day. This recipe takes a classic pie and makes it healthy by using whole grains and natural sweeteners. yum!! For those of you who don't care for pumpkin (it's a sin, mind you), here's a healthy recipe for Apple Crisp from SparkPeople. Served with a warm mug of coffee or cider, this would be an equally amazing way to end your festive fall day. Thus completes my recipe blog post on Healthy Thanksgiving Day recipes…at least until I find a few more that sound too good to share. Thanksgiving is all in what you make it. For me, it's about family and sharing what you're most thankful for around the dinner table with all of your closest friends and family. It's mayyyybe about eating a little too much because you're so blissed out with the blessings of one another. But here's what Thanksgiving shouldn't be - it shouldn't be about eating so much you feel guilty about your 'holiday binge' or gorging yourself on sweets and savory sides for days. Enjoy your time together. Enjoy your food. But remember what matters most. Take those cans of creamed corn and mushroom soup (you know, the ones hiding in your pantry that you won't be using thanks to your healthy substitute recipes) and donate them. Be a blessing. In what you say, in how you act, and in what you make to decorate your table. Because love is a language that is translated in many, many different ways.